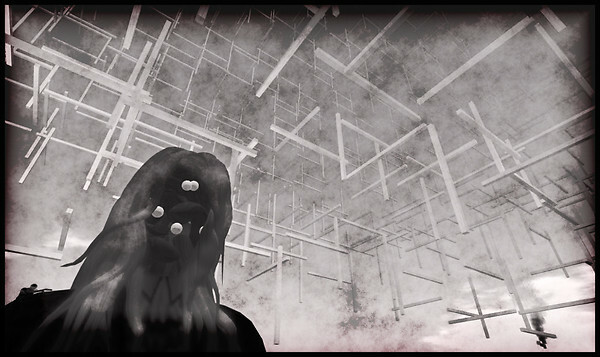 Selavy Oh brings together something truly interactive with her build ‘Irregularity’ at Burning Life this year – ''Initially, the structure is completely symmetric and regular, but becomes more and more irregular over time. 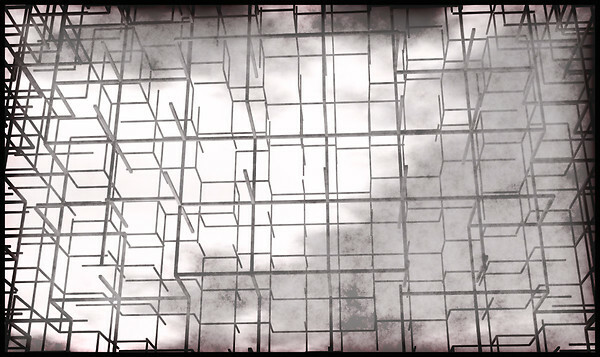 Each visitor actively participates in this transformation: When avatars fly through the structure and collide with it, the edges touched fall down and the structure temporarily becomes damaged. After a certain time, which depends on how many visitors are present, the edges will start to rise and slowly move back towards their original position. However, they never end up in exact the same position, thus resulting in an accumulative disarrangement of the structure'' – She writes in her note card by way of an explanation. Her work to me, on this particular occasion, makes me feel like I am playing and interacting with a maths formula, and an almost childlike feeling came over me – as I felt myself regress to that simple childhood state and I recalled the same curiosity of seeing what would happen when playing with building blocks – It’s great fun, and a great example of the how scripting in combination with a beautiful artist form, works on both a visual and technical level. Interactive art in this virtual world of ours provides an added immersive experience and this to me is a key factor. Q1. Tell us in 6 words what best describes you best of all. Q2. Tell us in 11 words what best describes your Art best of all. Q3. What brought you to the Metaverse and how did you get here? Just as every other avatar, I was created. You never know for what reason. You may be created just because of ennui, or you may be there to act as representation of your creator. You may even be an art project. But take your chance; get your own life, your own identity! Q4. You have an Art Project at Burning Life this year, what challenges if any did you have to overcome or consider whilst building at this particular event? Would you like to tell us a little more about your build? The challenge is always to build within the given boundaries. Since I had applied with a specific project in mind, the space and size restrictions actually posed a problem. But the most difficult challenge was the restriction on script load: my scripts take more time just because of their number, but I hope that white lebed continues to back me! 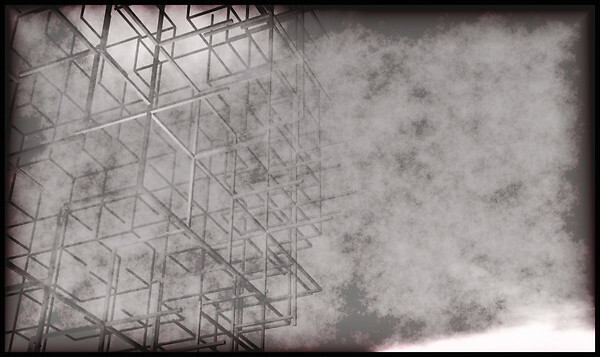 Briefly, my build called "irregularity" is a structure consisting of 1872 poles arranged in a three-dimensional grid and forming a hollow sphere. Initially, the structure is completely regular, but over time each intruding visitor participates in making it more and more irregular. At the end of burning life, I hope that the structure will have evolved to assuming a new unique shape, which is formed by the behaviour of the visitors. Q5. What is your personal favourite art plot or camp or indeed both at Burning Life this year and why? Well, I didn't really see much of the other work; just what's next to mine, and therefore I can't give an informed answer here. I’ve visited the plots of friends such as those of alpha auer, bryn oh, and dekka raymaker, I’ve seen the build of adam ramona, and I can recommend them all! and of course I’m looking forward to what others like am radio will show. Q6. What would you recommend changes in Second Life to facilitate the arts in a better way? An alternate user interface that could be used in the setting of a gallery or a museum. Presenting art that uses second life as medium in an exhibition is currently very difficult, and in my opinion an easy interface which allows not much more than moving and touching, not even teleporting, would help. and then a possibility to possess artworks, not just inside second life. you can possess a photograph, a video tape, even a CD containing the executable of a piece of computer art. but art made with second life will always remain on the servers of linden labs. at the moment, i'm afraid that this doesn't really help collectors and museums in recognizing virtual-world art as a serious art form. Q7. How important do you think the creative arts plays a role within the Second Life community? My guess, without being able to verify it, would be that it plays a similar role as in everyday life. Just as an example: the MoMa, which is open the whole year and makes 20 to 30 different exhibitions, has about 2 million visitors per year. The Munich beer fest, the Oktoberfest, which lasts for just two weeks every year, has about 6 million visitors. At least we have an advantage: while you can enjoy art in second life, drinking beer isn't really fun. Q8. What is your next project going to be? Are you mulling over anything? The next project is a terrain composition for several prims. Q9. In what way do you like to document your work in Second Life best? Which form would you personally recommend? How do you document a performance? Or graffiti on a subway door? Is a photograph or a video sufficient to document it? My work involves participation, and you cannot really document that, you have to experience it. But is an accurate documentation what we really need? What we need is an audience, and if we're lucky, we'll be remembered. Q10. We all tend to have an influence that inspires us when creating - whom has this effect on you? Taking a shower or reading the LSL (linden script language) wiki inspires me a lot. More seriously, and concerning the 'whom' in your question: art as I see it is always also about art. And therefore it's obvious that you certainly can find references to contemporary art and artists in my work; you may call that inspiration, but in fact it means placing my work in a context. Now Selavy - yo have a chance to ask yourself 3 questions it can be about anything you like ANYTHING! Q1. How frequently do you take showers? Q2. Why do you participate in interviews like this? Q3. How is Rrose doing? Rrose is well, she says Hi. can't stop laughing at asked but not answered questions ;) She did exactly what she was asked to do. Very Selavy style - precision and exact execution. Make sure to try her own Porta Potty. You have to use it to get the effect. the answer to question 3 just has to be the best response ever!